The National Space Council (NSC) will convene today (March 26) for the fifth time, and you can watch it live. The NSC meeting will focus on the United States' efforts to get humans back to the moon and then send people on to Mars and other distant destinations, NASA officials said. The meeting kicks off at 1 p.m. EDT (1700 GMT); watch it live here at Space.com, courtesy of NASA, or directly via NASA TV. "Vice President Mike Pence, chairman of the council, will convene and preside over the meeting, which will include a report out from NASA Administrator Jim Bridenstine," NASA officials wrote in a media advisory. 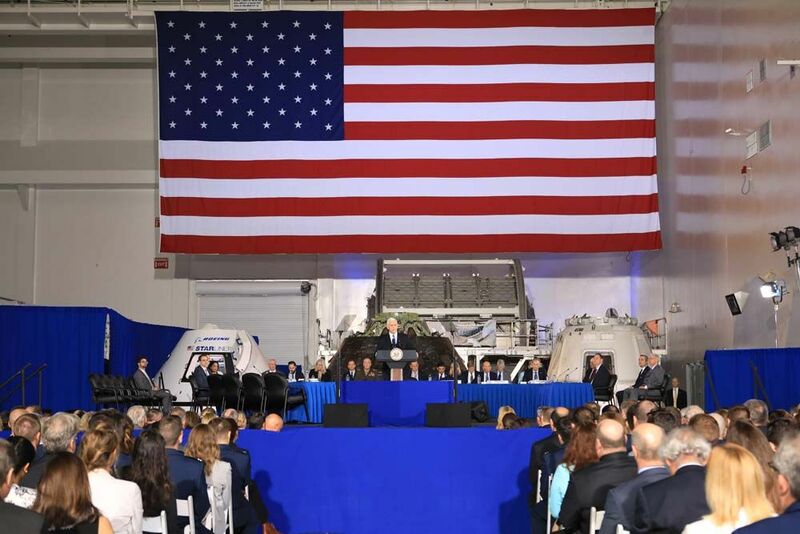 "The meeting also will include reports from various other council members, two expert panels on human space exploration, and council discussion, from which Vice President Pence will provide policy recommendations for the president," they added. The first panel, called "Ready to Fly," will feature Les Lyles, a retired U.S. Air Force general and former Vice Chief of Staff of the Air Force; Eileen Collins, a retired U.S. Air Force officer and former NASA astronaut; and former NASA astronaut Sandy Magnus.